Cipro Poisoning: Have You Been Floxed? : Current Cipro Weapons! 2000 mg plus of vitamin C, Magnesium Malate (833mgMalic Acid), Glucosamine and Chondrioten, Vitamin E, D and Calcium, oh, wait let's not forget the Fish Oil and probiotics and Ocuvite so I can still see to be able to warn others to be very careful taking any flouroquinolone!! Seems as all I do is eat and drink supplements! I have noticed an improvement after about 3 weeks of the high doses of Vitamin C.
You never know what really helps and I do have frequent setbacks, fortunately they seem shorter lived as time goes on! Last year I was able winnow the list down somewhat, more toward a liver support formula. Wondering if the glutamine and heavy B complex helped on digestive organs' recovery. I've never posted on a blog before, but I wanted to share what I've been learning about supplements since I've been 'floxed.' 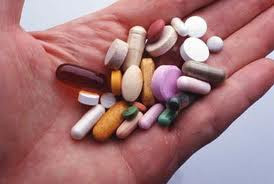 I believe it is important to consider the 'kind' of supplements you are taking because many of what we consider 'healthy supplements' can also be surprisingly toxic to the body. When buying supplements, try to buy whole food supplements (meaning, all of their ingredients come from natural whole foods.) Many kinds of vitamin C, magnesium, etc. that we see in health food stores or drug stores are derived from highly processed, unorganic, toxic sources. Even though your body needs these nutrients to heal, your body may not be able to absorb the 'fake' vitamins. So, even if you're experiencing some improvement from unorganic supplements, you'll be amazed at how much more you'll get out of whole food supplements. Not only will your body absorb way more nutrients, you will also be giving your tired body a well deserved rest. Since whole food supplements are so easily absorbed, your body doesn't have to use nearly as much energy to break it down. Now your body can focus on healing! I've only been recently 'floxed' so I'm still learning - but I've been doing my research! A good resource to check out is "Supplements Exposed" by Brian Clement. A good brand of whole food supplements is "Lifegive." Since I've switched to whole food supplements and a healthier diet, I've noticed improvement in my joint pain from taking Avelox. Cipro Makes Your Skin Hurt, Too! My Cipro Toes are Starting to Bend!